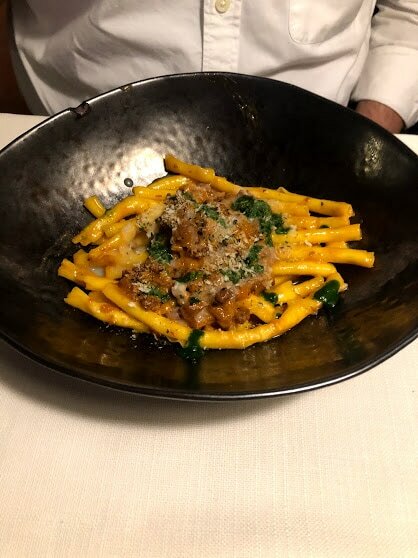 Folks who read my earlier post about eating our way through Emilia-Romagna asked me to skip all the blabbering and just show the food. This rabbit pasta was exceptional, but the portion was modest. That sent me off considering all sorts of once-in-a-lifetime trips: Antarctica and the basecamp at Mt. Everest in Nepal actually were on the list briefly. The excellent guide emphasized small towns and quaint, humble, family-run restaurants that served fresh, unprocessed local food. Emilia-Romagna, in northern Italy, extends along a line about 20 kilometers southeast of Milan to the Adriatic Sea. It’s home to Bologna, Parma, Modena, Ravenna and a bunch of cities with names you likely wouldn’t recognize. More importantly, it’s the birthplace of amazing food known the world over: Parmesan cheese, prosciutto, mortadella (the Italian cousin of bologna), balsamic vinegar, pancetta, bolognese sauce and more. It also happens to be home to…the 2018 World’s Best Restaurant, Osteria Francescana in Modena. That’s not the kind of coincidence that my husband, who relishes eating at big-name restaurants, could pass up. He managed to snare a highly-coveted reservation for one of the 12 tables at this temple to high-concept cooking. It is owned and operated by celebrity chef, Massimo Bottura. He recently was featured in a Netflix video series called Chef’s Table, describing his creative process. He clearly relishes the role of culinary heretic. With just 12 tables in the room, it was easy for Bottura to make the rounds, so all guests got to offer adulation to the genius himself. With a curt bow of introduction, he struck me as tiny and thin, with a thatch of mad-scientist, gray hair and fashionable black eyeglasses sized for a horse. Yes, our little foursome assured him, we were enjoying our dinner. The seasonal tasting menu was over-the-top in concept, execution — and yes, definitely the size of the check. 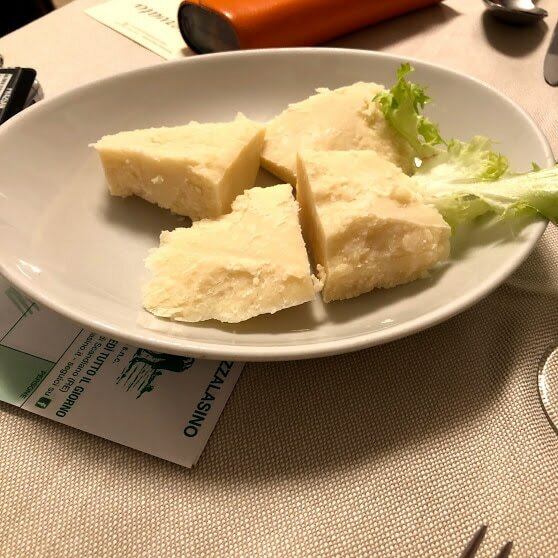 One of the courses was his famous “Five Ages of Parmigiano Reggiano in Different Textures and Temperatures,” which goes for 70 Euro a la carte. It came to the table as described — the cheese beautifully prepared both cold and hot and in forms from crisp to foamy to creamy. It’s well known as one of his signature dishes. In my mind, it compensated for two dishes that used eel to unpleasant effect. No matter, really; dinner at Osteria Francescana was not even our favorite. In fact, we found the humble, family-run restaurants the most satisfying. We went during the mid-October to mid-November season for truffles. A pasta came with a heap of meaty slices them, not a measly dusting from a fine grater. All the pastas — all homemade — came in reasonable portions of a cup or less as part of a meal, rarely as the whole meal. The salads and vegetables were as wonderful as the pastas and main courses. 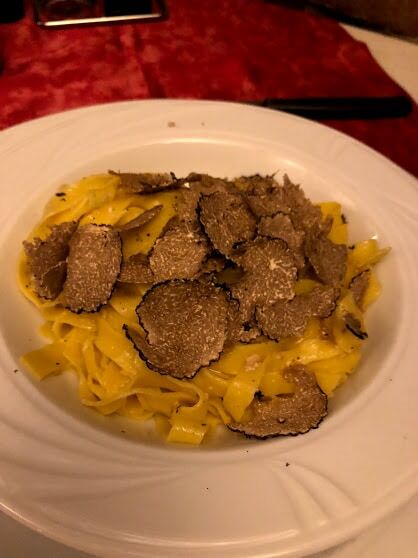 At Corte di Ca’ Bosco, they don’t skimp on the truffles. One night we drove to the foothills of the Apennine Mountains for dinner at Corte di Ca’ Bosco in Castello di Serravalle. We ate in a small, dark and romantic dining room that used to house the cows at night, now decorated with antiques and farm memorabilia. Mirella, one of the owners, waited on us. Her husband, Andrea, is known locally as Ringo, DJ della griglia or the “DJ of the grill,” as the restaurant’s specialty is grilled meats. 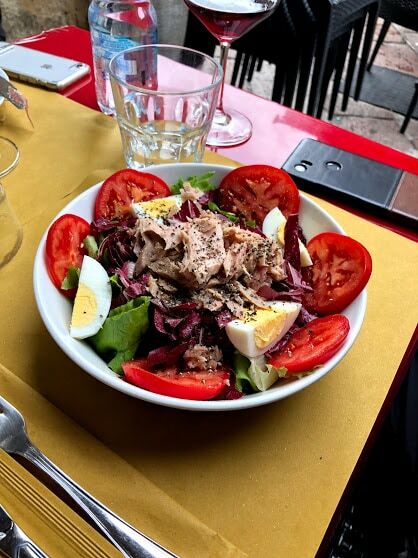 Our party nearly wept at a salad composed of radicchio, endive, sweet cherry tomatoes, parmesan cheese and grilled mortadella with a balsamic dressing. I started (my primi course) with a fresh pasta tossed in a walnut sauce and then moved on to a fillet of beef with shaved truffle. My friend had a mixed grill with the best sausage I’d ever tasted. After hearing my praise, Andrea fired up a few more links and sent them to our table. The salads and vegetables were as great as the other courses. The fact that I didn’t come home feeling bloated and overstuffed can be chalked up to two things: the moderate portions and the famous Mediterranean Diet, which is all about eating fresh and unprocessed food.